Receiving the spiritual guru with a warm welcome at Gorakhnath temple, the CM had a long close door meeting with Sri Sri. LUCKNOW: In a renewed mediation push to vexed Ramjanmabhoomi-Babri Masjid dispute in Ayodhya, spiritual guru and founder of Art of Living Sri Sri Ravi Shankar paid a surprise visit to UP CM Yogi Adityanath in Gorakhpur on Tuesday evening. Receiving the spiritual guru with a warm welcome at Gorakhnath temple, the CM had a long close door meeting with Sri Sri. However, the details of the confabulations were yet to come out. UP CM has been in Gorakhpur leading ruling party’s bypoll campaign trail from the front. Gorakhpur and Phulpur by-election are due to take place on March 11. Sri Sri’s meeting with the UP CM came a couple of weeks after a number of Muslim leaders, including members from the All India Muslim Personal Law Board and Sunni Waqf Board had visited him at his ashram in Bengaluru. During that meeting, the parties representing Muslim interests had supported the idea of thrashing out an out-of-court settlement of Ayodhya dispute with mutual talks and consent. Earlier in the day in Varanasi, Sri Sri appealed to all the stake holders of the dispute to give consent for an out-of-court settlement to the issue. He urged the Muslim community to gift the disputed land of Ram Janmabhoomi to Hindus for building a Ram temple respecting the common sentiment of 100-crore countrymen. Flagging off ‘Om Anugrah Rail Yatra’ from Varanasi to Ayodhya, passing through different towns and villages of the state along with 900 devotees, Sri Sri claimed that his efforts to find a peaceful solution, acceptable to all, were getting very encouraging response from across the nation and abroad. “If I take up a task, I stop only after taking it to a logical end by finding a well acceptable solution. I have not failed in my endeavours so far and I believe I shall get success in solving Adyodhya tangle as well,” he hoped. 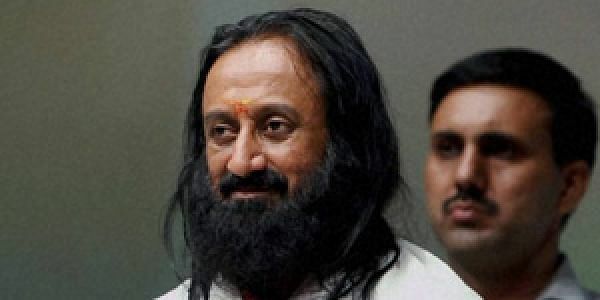 Batting for an out-of-court settlement to the dispute, Sri Sri said the court could solve it in favour of only one party. “In that case, the other side would feel bad and nurture a natural ill will for the winning party. This will enhance the communal divide in the society and the acrimony will continue for ages,” he averred claiming that finding solution to the issue was a lengthy and tedious process but he was confident of accomplishing it with the support of all. Sri Sri had last year initiated a dialogue process with "stakeholders" and had claimed that "very good and positive signs" had emerged from both the communities. However, there had been a lull in the dialogue process, with the Vishwa Hindu Parishad (VHP) and other religious leaders of litigants of both the sides distancing themselves from the spiritual leader's attempt to mediate in the protracted issue. The case is now pending in the Supreme Court. A three-judge Supreme Court bench has, meanwhile, fixed March 14 as the next date of hearing in the matter.